Is your driveway or walkways uneven? Do you have lumps and bumps? Are there tree roots that have grown under your walk or driveway areas and have they created a trip or fall hazard and unsightly? If you answered YES to any of the above questions, then you need the professionals at Conroy Property Services of Southwest Florida. We can not only fix these potentially dangerous situations but we will come out to your property at NO CHARGE and give you a FREE consultation, no obligation diagnosis of what is causing the problem(s). And our highly trained technicians will tell you exactly how we will make your pavers safe and beautiful again. You spent a lot of money to have a beautiful walk or driveway when you decided to add this great looking feature to enhance the beauty of your home. And unfortunately, nothing will stay looking ideal forever especially when an outdoor surface is constantly being exposed to the elements. Mother Nature can wreak havoc on any material including stone or brick. And if you have trees nearby, those roots have a mind of their own. In addition, pavers will have a tendency to shift which will cause the surface to become unstable. Also, a surface that is uneven can hold water which will increase the quickness of the regress. Fixing pavers is not for the inexperienced homeowner or handyman. It’s a little more complicated than just replacing one paver for another. You need a company that can make the proper observations and has the correct tools to do the job right the first time. Let’s say your walkway is uneven or has raised areas due to tree roots. We will then reinstall your pavers into the proper position, AND apply stabilizing sand to the entire area. The experts at Conroy Property Services are able to do many types of repairs. From simple cosmetic fixes to sweeping overhauls. With some issues, we can use your existing pavers to save you money. Because we have years of experience we can ensure that you will get the best possible outcomes. Repairing or replacing pavers isn’t something you learn on the fly. It takes many years to learn the intricacies of this profession. So be careful that you only hire a company that has the ability to do justice to your property and helps restore your walkway, driveway or patio back to its original beauty. It’s inevitable, especially if your pavers were not sealed, that motor oil leaking from your car can stain your pavers. Fortunately, the oil will not damage the paver. But, the stains can be problematic to remove. As soon as you see a stain and the quicker you take care of it, the lesser the chance that it will penetrate the paver. Once it starts getting deeper into the stone the harder it will be to remove. At the first sign of a stain, call us and we will immediately remove the stain before there is any further harm. We have specially designed eco-friendly cleaning solutions to remove most stains. 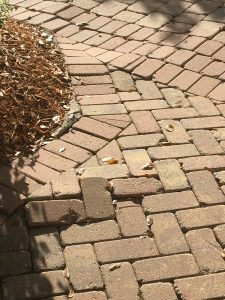 Though in some cases, it might be just easier to just replace the stained paver with a new one. But your best defense against many potential stains is to get them sealed. This will keep your driveway or walkway not only be protected from motor oils and other potential stains, but it will give it a beautiful sheen. It isn’t something you have to do, but it is a smart decision to help extend the life of your pavers and protect them from foot and car traffic. Plus, having your pavers sealed makes it so much simpler to clean. Many clients prefer glossy pavers because it gives the pavers that “wet” look which causes the paver to look more vivid. We will thoroughly prepare your pavers with our patented cleaning system, which will prepare them for having the sealant applied. we will then apply a commercial grade sealer to your entire paver area. We guarantee our repair work for one year! 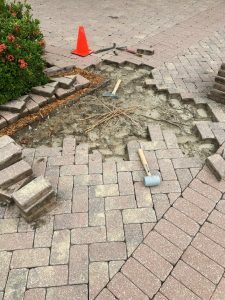 Most other companies will come out, take out a few pavers, tamp down the old dirt and then put your pavers back into place. And most of them won’t even bother to come out and do the work if it’s less than $1000! That’s where we are different from everybody else. Our motto has always been that no job is too big or too small and that everyone deserves respect, regardless of what neighborhood you live in. Call Conroy Property Services at 239-249-5290 or you can make an appointment online for a free estimate.